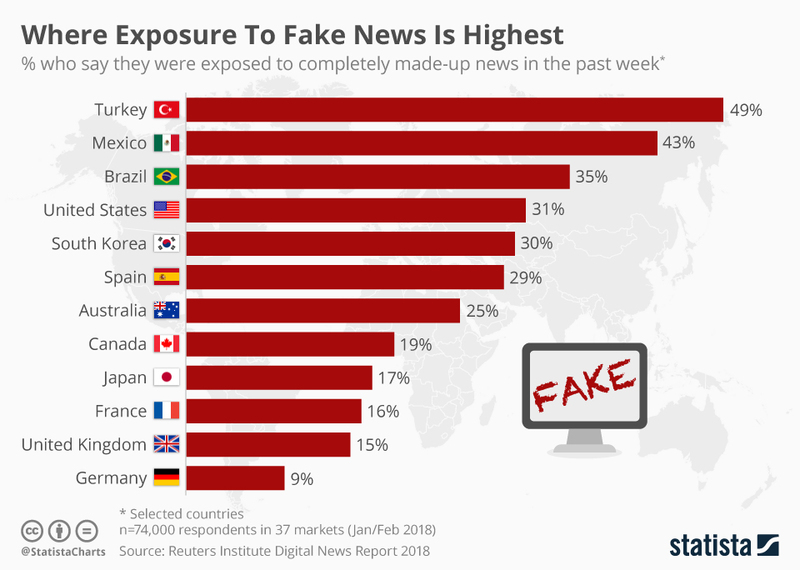 Fake News has become much more prevalent due to the spread of social media and our reliance on internet sources. Some politicians may use the term "fake news" to disparage reputable news sources that report unflattering information - this is not the type of fake news covered in this guide. Instead, we focus on misinformation, disinformation, and disreputable information sources. This guide will help you tell fact from fiction, and give you the skills to navigate the world of information. You will find more polling data and infographics at Statista. Can you tell real news from fake news? Play Factitious to find out! Want some help identifying reliable sources? Ask a librarian! Chat with us! Open the "Have a Question?" bar at the bottom of any library webpage. Visit the Help Desk on the first floor of Fogler Library! Text us! Text the word BEAR to 66746, then send your question. You can also set up a meeting with your subject librarian. To find out who that is and how to contact them, visit our list of Subject Specialists.